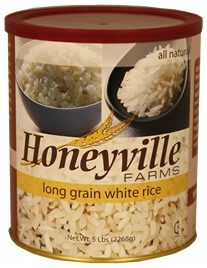 Each #10 can contains 5 pounds of Long Grain White Rice. Ingredients: Long Grain White Rice. Shelf Life: 10 to 15 years in the sealed #10 can (with included oxygen absorber) under ideal storage conditions.